Hello my friends! I'm so sorry I have not been posting very often, but summer has brought many opportunities to be busy in other ways, and my blog has had to take a rest for a bit. However... I did want to give you a quick sneak peek of what's coming your way July 1 from Our Daily Bread designs! This card is made with a new set called Loving Memories. 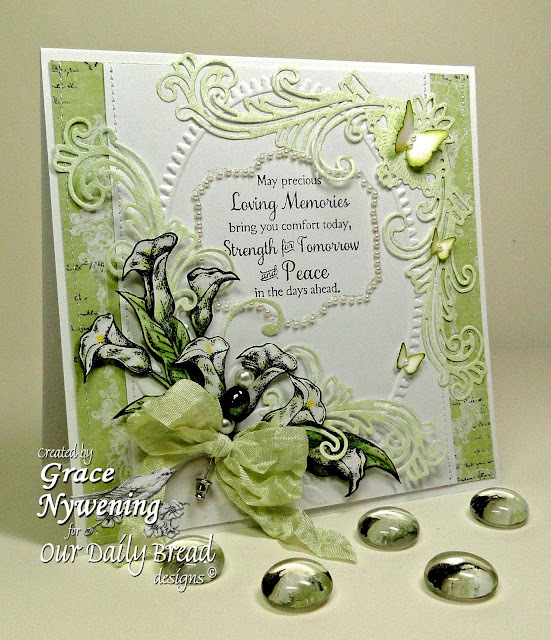 I love the sentiments in this set, and the pretty Calla Lilies are perfect to go along with these sympathy sentiments. Of course, sympathy cards are our most difficult cards to make, but when we do.... Our Daily Bread designs has the tools you need to do it well! This is timely for me as well as I need a sympathy card for a dear friend. Just so you know.... sympathy sets are only a couple of several sets coming July 1! You won't want to miss this release! The bread sticks are working hard on our blog hop projects for you... we hope to see you then... July 1, 8:00am EDT! Before I let you go, I want to let you know you still have time to get in on the TWO big sales going on now at Our Daily Bread Designs! Check them out HERE and HERE.... but don't wait long! Time is almost up! See you on the first!!! Grace this is so soft and elegant. Love those lilies and the sentiment. Your soft green flourishes are divine!! This is just beautiful, Grace...as always your creations take my breath away! Like you, I've been very busy with other things and haven't been very creative with paper lately. Spending next week with our daughter and family at Folly Beach in S.C. and excited to be with them. i love the soft colours and the embellishments! Stunning card, Grace! The colors are so soothing and the sentiment and lilies are gorgeous! Sorry you needed a sympathy card, but I'm sure the recipient will be comforted by your beautiful creation. Take care and big hugs! Just lovely. I adore that pin. Thanks for playing with us at Little Red Wagon. This is an amazingly beautiful card. The pin is lovely, and I'm very excited about the new ODB stamp sets. wish I own them all! Thanks for playing along with us at Word Art Wednesday, and for sharing this in the challenge. Your participation is a big blessing to us. Have a great week, and enjoy your busy summer. What a beautiful card!! Thanks for playing with us at Paper Playtime. What a striking card Grace!! The greens with the white are gorgeous!! I love all the flourishes and that beautiful pin!! WOW! a beautiful, soothing card, Grace! So very gorgeous Grace! I love everything about this beautiful creation! what a beautiful card so soft and loving. lovely saying the colors are just perfect as is your cards always. Gorgeous card, lovely image and great colour scheme. I am so glad to be visiting your blog today. This is such an amazing card! I love the sentiment and the pearls surrounding it. The lilies are colored in such an amazing way, they really are fabulou. I love the flourishes you have on here, and must check them out. The pin is a wonderful addition to bring the green out. Dearest Grace I am so sorry that you will be missing your friend. I will pray for her family, and of course for you, my friend. Oh, this is amazing! GORGEOUS coloring and I LOVE the pearl frame around your sentiment. This is just stunning! Grace, your beautiful creations always make me swoon! you are soooo my hero....in stamping and as a mentor and friend! Love ya, GF!!! Grace, this is absolutely stunning! The colors, coloring, and cut work detailing with the Calla Lilies is amazing! Beautifully done! A lovely Card with beautiful Colors. Thanks, for playing with us at Stampavie and more. Oh WOW!! This card is just stunning. So beautiful. I wouldn't mind getting that in my mailbox. Everything is just right on the card. Can't stop saying: WOW!!! This is beautiful, Grace. I hope the loveliness of the card will be a bit of a balm for the one who receives it. As well as knowing that a part of you, and I'm sure many prayers, wen't into the making of it.